The Jewel of the Great Lakes, Milwaukee works hard and enjoys a good time, just like your team will as they take on fun challenges during our team building activities and corporate training programs. Home to manufacturing, stockyards, rendering plants, shipping, and other heavy industry, Milwaukee lets off steam with its many festivals and breweries. The blend of Low and High Ropes activities unifies teams while exploring risk, leadership, communication, problem-solving, and coaching. The Low Ropes Course focuses on team collaboration; attempt the Postman’s Walk under a canopy of trees at our Oconomowoc course. No low challenge is possible to complete on your own; call on every member of the team to generate ideas and provide support. 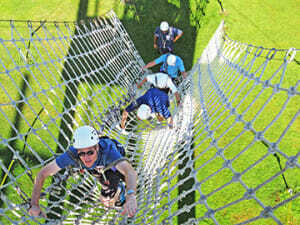 The High Ropes Course emphasizes risk-taking and the creation of a culture of encouragement. Our courses in the Milwaukee area offer exciting challenges for our corporate teams – you may try the giant swing or scale the 40 feet climbing wall near the shores of Lake Geneva or traverse a local university via rope ladders and zip lines. The challenges allow participants to expand their comfort zones—sometimes dramatically—and recognize fears that may block personal achievement. The ropes course memories and moments carry over to the work environment for a long time. If you’re looking to incorporate philanthropy and fun into your next team building event, our Golf for Goodness Sake program blends innovation, creativity and corporate social responsibility. Build a mini-golf course out of non-perishable food items and compete in a Tournament round before donating items to a local Food Bank. Continue to learn new things about your coworkers and how your personality preferences connect with those of your co-workers during our Myers-Briggs Type Indicator® workshop at the beautiful Pfister Hotel or art deco Ambassador Hotel.